Chattanooga, Tenn. – Dr. Zeb Hogan, University of Nevada Aquatic Ecologist and National Geographic Fellow, has made a career out of collecting fish stories. He’s been on a quest to find, study and protect the world’s remaining freshwater fish that reach epic proportions. They’re not only BIG Fish, they’re MONSTERS! In spite of their size, most of these behemoth species are rapidly declining in the wild. These ancient fish need help since they play critical roles in their freshwater habitats. Aquarium guests will be able to take a deeper dive into the hidden world of these preposterously huge species when “Monster Fish: In Search of the Last River Giants,” a National Geographic exhibition opens on October 1st. This special exhibition, which is free with Aquarium membership or general admission, will be located in the Riverplace building. The entrance will be next to the Aquarium’s ticketing center. “Monster Fish” takes visitors on a journey to river basins around the world to learn about colossal fish and the people that depend on them. Through life-sized sculptures, hands-on interactive exhibits, and videos from the field, the exhibition showcases close to 20 fish species and their diverse freshwater ecosystems. One of these replica creatures, the super-sized sawfish, is climbable. From mythical tales and storied traditions to threats and conservation efforts, guests will leave with a greater understanding of the connection between humans and fish. Themed areas of this new exhibition provide visitors with opportunities to learn about how monster fish grow, how scientists study them, and how anglers and other individuals can help fish survive. 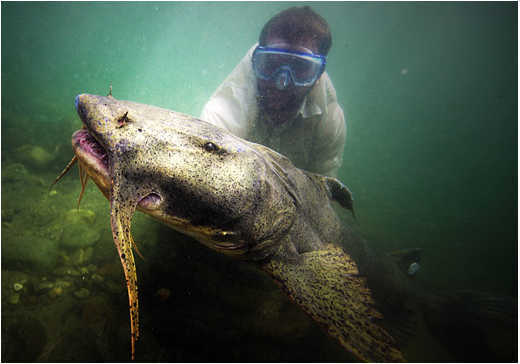 Hogan’s Nat Geo WILD series “Monster Fish,” is now in its sixth season. In each episode, Hogan immerses himself in a local culture, where fishing is often more than a sport or even a profession – it’s a way of life. He tastes the regional cuisine, mingles at fish markets, listens to the harrowing stories of native fishermen and sleeps where his local guides do. 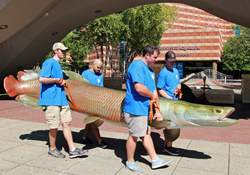 Nat Geo WILD has scheduled a Monster Fish marathon on Sunday, October 2, from Noon to 7 pm eastern (11 am to 6 pm central) to celebrate the exhibit opening at the Tennessee Aquarium. This new exhibit is also a huge educational opportunity for regional school groups visiting the Aquarium. The College of Science at University of Nevada, Reno, where Hogan is a researcher, is the educational partner for the “Monster Fish” exhibition and provides support for Hogan’s participation in the project. The University has created an Educator’s Guide for children in grades 4 through 8 to explore the science and geography behind the exhibition and Hogan’s research. The guide provides a number of interactive classroom activities to engage students before and after a visit to the exhibition. After visiting, guests of all ages will leave knowing which of the legends are real……..and where there may be something VERY BIG lurking just beneath the surface of the world’s lakes and streams. The National Geographic Society is a global nonprofit membership organization driven by a passionate belief in the power of science, exploration and storytelling to change the world. We fund hundreds of research and conservation projects around the globe each year. With the support of our members and donors, we work to inspire, illuminate and teach through scientific expeditions, award-winning journalism, education initiatives and more. The Tennessee Aquarium inspires wonder, appreciation and protection of water and all life that it sustains. Admission is $29.95 per adult and $18.95 per child, ages 3-12. Each ticket purchased helps support Aquarium conservation programs. The IMAX® 3D Theater is next door to the Aquarium. Ticket prices are $11.95 per adult and $9.95 per child. Aquarium/IMAX combo tickets are $37.95 for adults and $26.95 for children. Excursions aboard the new River Gorge Explorer depart daily into “Tennessee’s Grand Canyon.” Cruise tickets are $32.00 per adult and $24.50 per child (3-12). Advance tickets may be purchased online or by phone at 1-800-262-0695. The Aquarium, located on the banks of the Tennessee River in Chattanooga, is a non-profit organization. Open every day except Thanksgiving and Christmas, the Aquarium and IMAX are accessible to people with disabilities.